WHAT WE KNOW? Everybody is back except for the Olsen twins so that is the big gossip. Other than that, they all seem very happy to reunite as a fake big family. Which is sort of nice. I am not sure about this one. I am excited, I confess. But I am scared of being too excited. My logic tells me I will be disappointed for many reasons. One, I was a kid when I watched this… and as it usually happens with childhood things, the magic is lost when you revisit them as an adult. Also, the concept of the show was VERY 90s. Shows about “families overcoming adversity” [without them fighting aliens or some other bizarre twist] are rare now. But… maybe we are ready for them to make a comeback? The difficult thing is… they need to update it without turning it into something else. So my fear is that they will either be TOO vanilla for the times or… try to fake edginess. Or maybe… just maybe, they will get it right! And we will rejoice in nostalgia. I have to say, that Jimmy Fallon Trump spoof got me a bit more excited. But you can never go wrong with a Trump spoof. 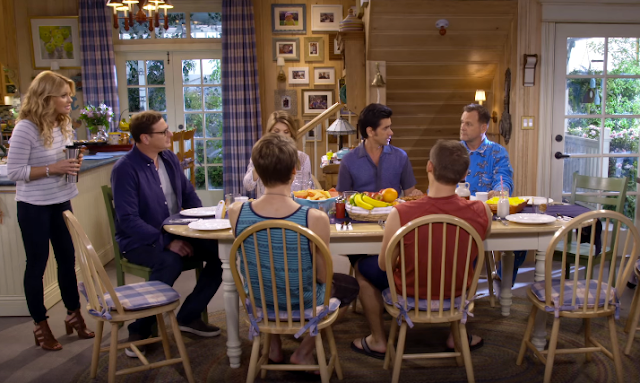 Update 3.4.16 It is one week after the premiere of Fuller House and I have already watched all the episodes. I have to admit, I loved it and I am glad a second season has already been ordered. They basically kept the show as close to the original as they could and turns out... that's exactly what I wanted. It's good to have a cute dose of nostalgia every once in a while.